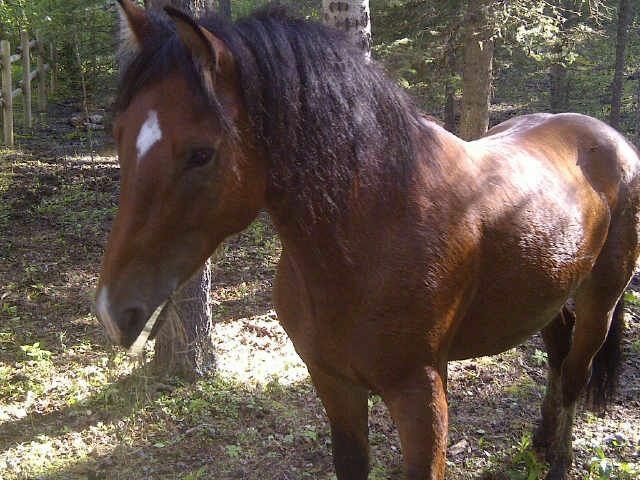 We received messages that a couple of wild studs had ventured onto private land south of Bragg Creek. These two boys were interested in two Icelandic mares that the landowners have. Concerned over this, WHOAS was contacted to help come up with a solution to deal with these two wayward boys. Previously the owners had contacted livestock inspectors whose only solution was to round them up and take them to auction and then probably bought by meat buyers. This was totally unacceptable. In all our dealings over the years with the ESRD about the wild horses, we have always stressed that it is not the numbers that should determine policy in regards to management of the wild horses, but whether a particular group or individual horse is in a problem area. By this we mean causing private land owners and lease holders problems with their animals or land areas. 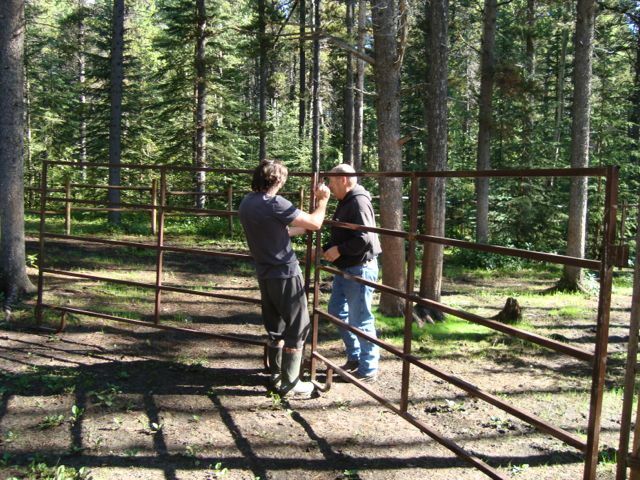 WHOAS has always been willing to work with these people to solve any conflicts that they have with the wild horses. We have given this aide and assisted in solutions many, many times since WHOAS was formed. 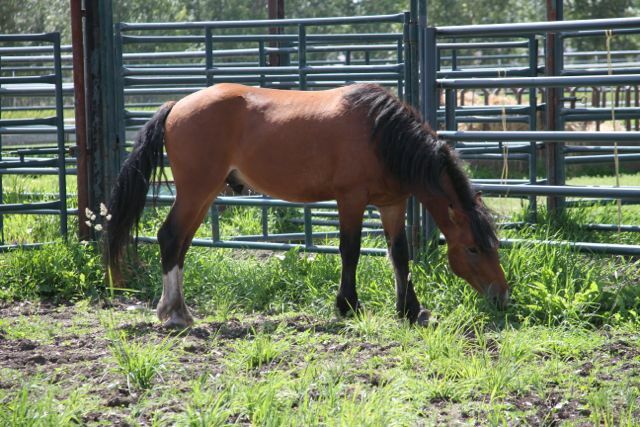 This is another example of the work we are willing to do to save the wild horses. As a result of the property owners calls for help, it was decided that members of WHOAS would visit on Saturday, August 3 and determine what would be the best outcome for all. The couple that had been dealing with the wildies had spent a considerable amount of time with the younger of the pair. This had allowed the young boy to gain some trust in us humans. The other boy had nothing to do with this and escaped back onto the public land behind their property. This is where he will hopefully stay. Upon arrival we found that the couple had also been able to to put a halter on him and had calmed him to the human touch. This was quite a feat in the three weeks he had been hanging around their mares. 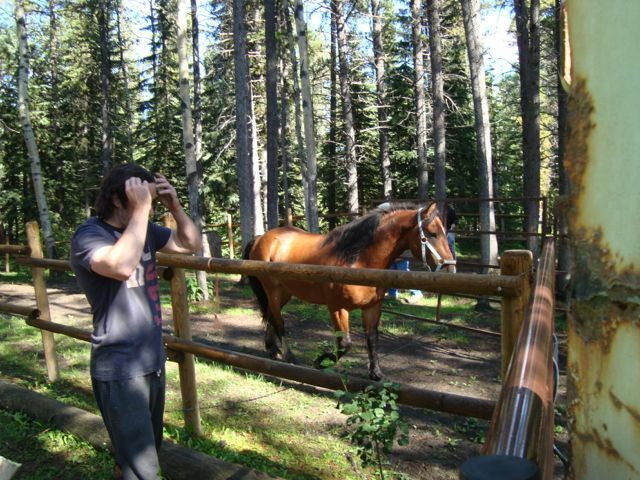 After assessing what would be the best for this horse, it was decided that it would be detrimental to him to be relocated in the wild because of this human contact. Therefore the best solution was for us to take him to our handling facility where we would work with him to the point where he was gentled enough that he could be handled by anyone. This would include getting him gelded. Needless to say we had to set up a pen at the back of our horse trailer so that we could move him safely. 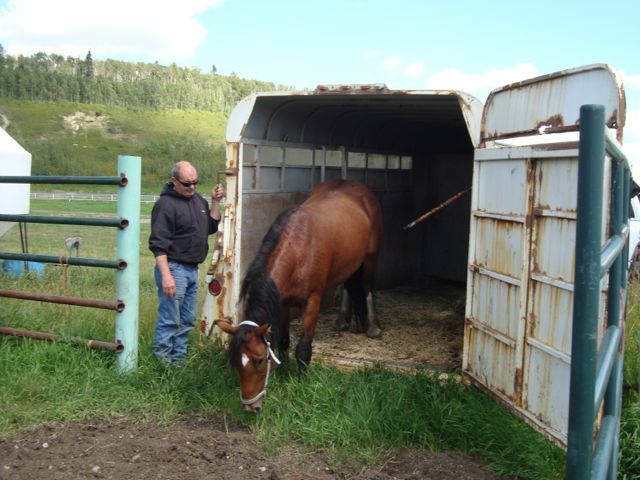 As a result of the handling he had received, he followed Nick into the pen encouraged by seeing the two mares standing outside the trailer. The young boy was extremely calm about this whole procedure that was happening to him. 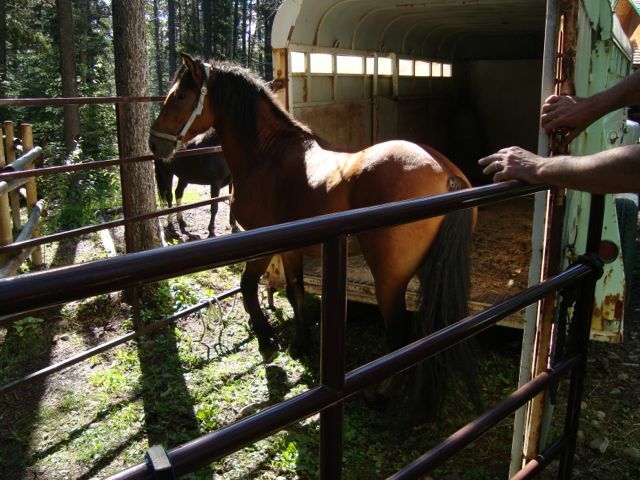 Patience is the key in dealing with a young wild horse like this so that he would be able to be handled and loaded into trailers down the road. 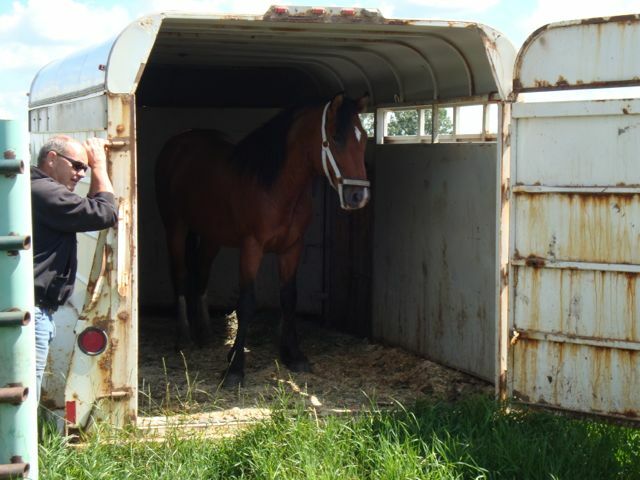 So with all of us working as a team, the slow but steady work at getting him to load himself into the trailer began. Nick luring him with feed, Deborah luring him with a cute mare, and the rest of us putting easy pressure on him from behind would allow him to decide to move into the trailer. The procedure was a long one, but would be the best for the young boy and we had lots of time to make it right for him. After a period of time at the urging of Nick and Deborah, the young man finally put his two front feet up into the trailer. His next step was to getting one of his back feet in and there he stood for quite awhile contemplating what he should do next. In all the way or should I get out of here? 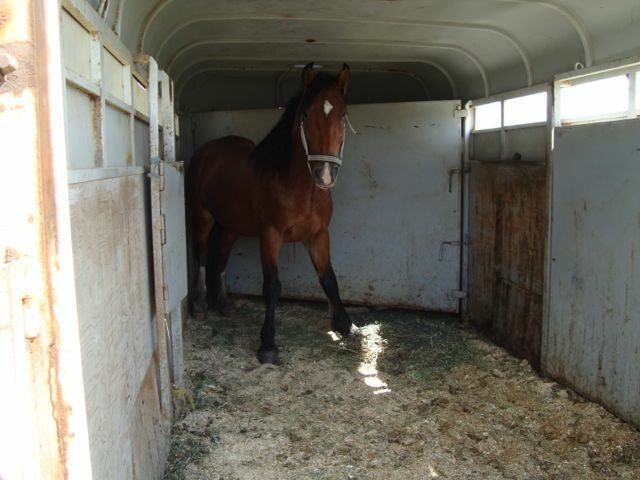 With a little bit more urging he finally loaded himself completely into the trailer and the door was shut. The adventure of a new life was just about to begin for him. After an emotional goodbye by Nick and Deborah we were on the road. A two hour road trip got us to what would be his new home for awhile. The nature of this beautiful young horse was evident in how well he handled his first trailer ride. We had to laugh at the way he backed himself into the corner of the trailer to brace himself for the trip. We were also amazed that he was so calm and not sweated up at all after this journey. Now you want me out? The decision to come out of the trailer had to be his again and on his own time. At the unloading pen there was quite a bit of green grass and it was amusing to watch him savour this delicacy still standing firmly inside the trailer. Allowing him time he finally got his two front feet out to get at more grass! Back feet were not moving however. We chuckled again at his fascinating antics. Finally he dislodged himself totally from the trailer and started to walk about examining this new space. His training has already begun with Jack in order to totally gentle him and making him safe to be handled both for himself and others that may be around him. 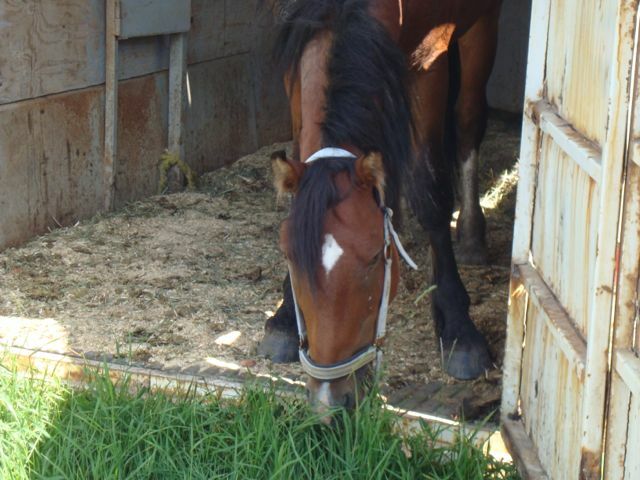 His story will continue as we keep you up-to-date on this beautiful and lucky young horse. We really want to thank Deborah and Nick for giving such a magnificent creature a chance for a safe life. Great story, Bob, love that the outcome for this young guy is positive. Thanks again for all the great work you do for the wild horses! Wow! I am amazed at how easily he came to his new home & so happy that this beautiful guy gets a chance at a new life instead of being senselessly slaughtered! Great Job! So amazing that he was relocated…any more word on the one that got away from the people …if he has come back or left completely.. So very proud that he will not end up at the meatmarket. Thanks for all you do. Thank you for the work you do. You are good people. Such A Beautiful & Heartwarming Story… I Still Have GooseBumps! thank You For Sharing! Possibly he’s young enough to domesticate. The older one may be a stray that is fed up with us two-legs.